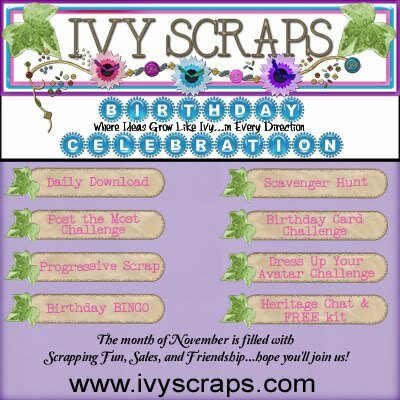 Starting on Nov. 1st, we are having a birthday celebration at Ivy Scraps. Be sure to stop by and share in all the special things going on, as well as grabbing the daily download. November's Mega Kit is called Thankful and it is the prettiest one yet. You won't want to miss it. We are having a speed scrap on Nov. 2 and a heritage chat on Nov. 16th. Check the forum for details on Monday. Hope we will see you there.